IMPACT currently coordinates volunteer opportunities with sixteen different community service agencies in the Auburn-Opelika community. Any student can volunteer to participate in these weekly opportunities. If a student wants to come volunteer at any of IMPACT’s different projects, all the student has to do is show up. Students do not have to sign up to volunteer and there are no meetings to come to. IMPACT has a schedule listing every volunteer site and the times to volunteer. 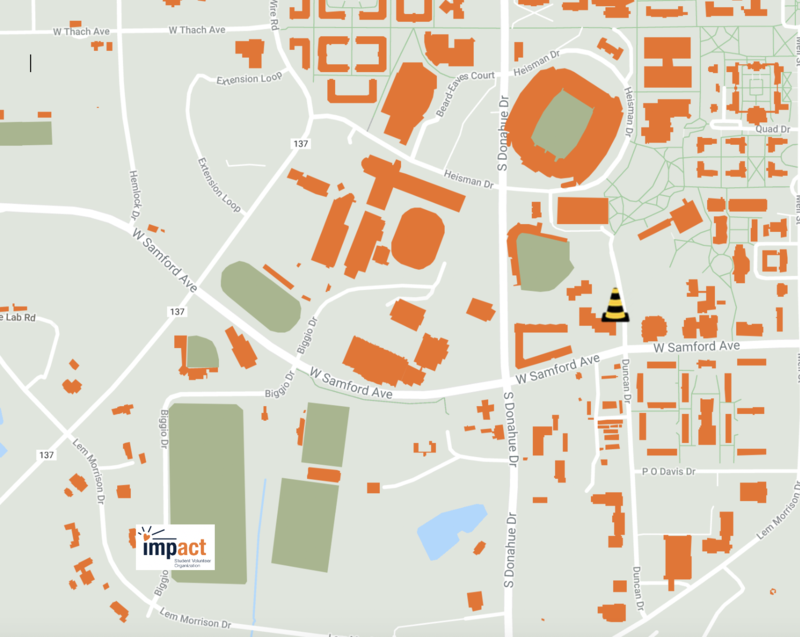 Students will meet IMPACT Project Coordinators at the Intramural Fields (near Auburn’s softball field) at the time specified on the schedule. The Intramural Fields are the 4th stop on the Park and Ride Tiger Transit. Click HERE for the map. AUMC Food Pantry – The AUMC Food Pantry provides emergency assistance to hungry families in Lee County. Volunteers will assist with loading and unloading shipments, separating food, helping clients collect items, and cleaning. Azalea Retirement Home – Azalea Retirement Home is a wonderful place to talk to the elderly community in Auburn. Volunteering at Azalea is all about spending personal time with the residents and having real conversations with them, as well as playing their favorite games. Bingo is a classic favorite and occasionally you may even play with a few residents on a Wii! Carver Primary – Carver Primary is an after-school program for boys and girls at the elementary school. Volunteers will assist the students with their homework, as well as play games and sports with the children. Community Market – Community Market is a nonprofit organization that provides food for families in an emergency situation. As a volunteer, you will assort groceries into the refrigerator, freezer or onto the shelves. You also assist the shoppers in bagging and weighing their groceries and simply providing a friendly smile. Food Bank of East Alabama – The Food Bank of East Alabama is a nonprofit organization that collects food in order to feed the hungry and less fortunate. When volunteering at the food bank, you will help the staff organize the pantries and other little projects. Organizing the pantries may seem like a thank-less job, but it is a huge help to the staff members. Closed-toed shoes required. Humane Society – The Lee County Humane Society provides a shelter for many stray animals including cats, dogs, hamsters, and rabbits. Volunteers will clean the cat and kennel areas and check the animals’ food and water levels. In addition to this, they might organize food and treats, help clean cages, put nametags and collars on cats and dogs and walk the dogs. Closed-toed shoes are required. I Am My Brothers Keeper (IAMBK) – IAMBK is a great place to volunteer if you love kids. Volunteers work with at-risk youth which involves: tutoring and other activities. Jason Dufner Foundation–The Jason Dufner Foundation focuses on ending childhood hunger in Lee County, Alabama through partnerships with local, regional and national organizations. Currently, the foundation provides weekend meals for more than 1,200 children throughout the school year and over the summer break. Volunteers will assist in loading, unloading, and packing meals that will be distributed throughout the Lee County area. Joyland Daycare Center –The Joyland Daycare Center is a local daycare center for children ages 3-12, and many of the children see it as a second home. Volunteers assist with snack time, inside games, homework help and playground time. The teachers also appreciate your help with things in their classroom. Kreher Preserve & Nature Center – The Kreher Preserve & Nature Center is an on-campus volunteer site. At this site volunteers will help maintain areas of the preserve. Volunteers can expect an assortment of tasks, such as refilling the bird and deer feeders, washing and feeding the education animals, maintaing the trails and facilities, and creating displays and artwork for their programs and seasonal events. Oak Park Nursing Home- Oak Park is another great place to interact with the elderly community in Auburn. In this active lifestyle community you can play bingo, balloon volleyball, or just sit and have a conversation with one of the residents. Pine Hill Literacy Project – The Pine Hill Literacy project was created to make reading an engaging and enjoyable experience for first through sixth graders. Pine Hill seeks to equip children with the proper resources and attention to become more proficient readers in order to ensure their academic success. Volunteers will assist children in reading tasks as well as reading to groups of children. Reading is Fundamental – Reading is Fundamental is a national organization that is combating illiteracy. Your help is needed to label books that are sent to at-risk children, which may be the first book that they have ever held. Closed-toed shoes are required. The Salvation Army– The Salvation Army is a charitable organization that seeks to help individuals in need through the use of charitable donations. Volunteers at the site will not only help organize incoming donations and facilitate store operations, but also provide a comforting atmosphere for all walks of life. Close-toed shoes are required. Storybook Farm – Located in the rich pastures of Opelika, Alabama, Storybook Farm offers spiritual nourishment and emotional healing to children with disabilities, life-threatening diseases, or those who have suffered a loss. Storybook Farm provides hope on horseback for our riders through a unique program of therapeutic horseback riding and creative activity. While volunteering at this site, you can expect to help with the daily tasks of helping maintain the farm and its animals. Closed-toed shoes are required.